‘This person was known throughout the region as the ‘Boy Prophet’ even though at the time of the incident with the steer’s head the Boy Prophet was fifty-eight years old. The man’s real name was Efim Gerasemovitch Klubniken, and he had a remarkable history. He was of Russian origin, his family being among the first Pentecostals to come across the border, settling permanently in Kara Kala. From earliest childhood Efim had shown a gift for prayer, frequently going on long fasts, praying around the clock. As everybody in Kara Kala knew, when Efim was eleven years old he had heard the Lord calling him again to one of his prayer vigils. This time he persisted for seven days and nights, and during this time received a vision. This in itself was not extraordinary. Indeed, as Grandfather had been accustomed to grumble, anyone who went that long without eating or sleeping was bound to start seeing things. But what Efim was able to do during those seven days was not so easy to explain. Efim could neither read nor write. Yet, as he sat in the little stone cottage in Kara Kala, he saw before him a vision of charts and a message in a beautiful handwriting. Efim asked for pen and paper. And for seven days sitting at the rough plank-table where the family ate, he laboriously copied down the form and shape of letters and diagrams that passed before his eyes. When he had finished, the manuscript was taken to people in the village who could read. It turned out that this illiterate child had written out in Russian characters a series of instructions and warnings. At some unspecified time in the future, the boy wrote, every Christian in Kara Kala would be in terrible danger. He foretold a time of unspeakable tragedy for the entire area, when hundreds of thousands of men, women, and children would be brutally murdered. The time would come, he warned, when everyone in the region must flee. They must go to a land across the sea. Although he had never seen a geography book, the Boy Prophet drew a map showing exactly where the fleeing Christians were to go. To the amazement of the adults, the body of water depicted so accurately in the drawing was not the nearby Black Sea, or the Caspian Sea, or even the farther-off Mediterranean, but the distant and unimaginable Atlantic Ocean! There was no doubt about it, nor about the identity of the land on the other side: the map plainly indicated the east coast of the United States of America. Well, many people in Kara Kala smiled at these romances of a little boy. Surely there must be some explanation of the ‘miraculous’ writing. Perhaps he had secretly taught himself to read and write, just in order to play this trick on the village. Others however took to calling Efim the Boy Prophet and were not at all convinced that the message was not genuine. Every time news of fresh political troubles reached the tranquil hills around Ararat, they would get out the now-yellowed pages and read them again. Troubles between the Moslem Turks and the Christian Armenians did seem to be growing in intensity. In August, 1896 – four years before Grandfather butchered the blind steer – hadn’t a Turkish mob murdered more than six thousand Armenians on the streets of Constantinople? But Constantinople was far away, and years had passed since the giving of the prophecy. True, prophecies in the Bible often came dozens, even hundreds of years before the event. But most people in Kara Kala, Grandfather among them, believed such genuine prophetic gifts had ceased with the completion of the Bible. And then, a little after the turn of the century, Efim announced that the time was near for the fulfilment of the words he had written down nearly fifty years before. ‘We must flee to America. All who remain here will perish’. Here and there in Kara Kala Pentecostal families packed up and left the holdings that had been their ancestral possessions time out of mind. Efim and his family were among the first to go. 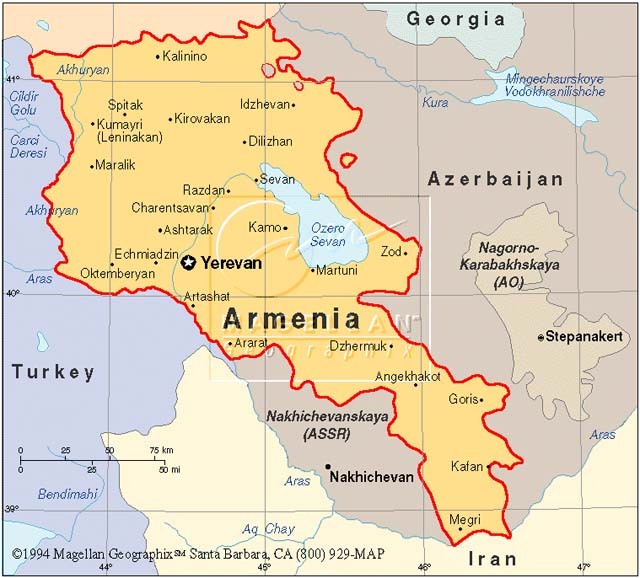 As each group of Pentecostals left Armenia, they were jeered by those who remained behind. Skeptical and disbelieving folk – including many Christians – refused to believe that God could issue pinpoint instructions for modern people in a modern age. But the instructions proved correct. In 1914 a period of unimaginable horror arrived for Armenia. With remorseless efficiency the Turks began the bloody business of driving two-thirds of the population out into the Mesopotamian desert. Over a million men, women and children died in these death marches, including every inhabitant of Kara Kala. Another half a million were massacrated in their villages, in a pogrom that was later to provide Hitler his blueprint for the extermination of the Jews. ‘The world did not intervene when Turkey wiped out the Armenians’, he reminded his followers. ‘It will not intervene now’. The few Armenians who managed to escape the besieged areas brought with them tales of great heroism. They reported that the Turks sometimes gave Christians an opportunity to deny their faith in exchange for their lives. The favorite procedure was to lock a group of Christians in a barn and set it afire: ‘If you are willing to accept Mohammed in place of Christ we’ll open the doors’. Time and again, the Christians chose to die, chanting hymns of praise as the flames engulfed them. Those who had heeded the warning of the Boy Prophet and sought asylum in America, heard the news with dismay’. This entry was posted in Persecution, Testimonies, Visions and tagged armenia, boy prophet, Demos Shakarian, Efim Gerasemovitch Klubniken, genocide, kara kala, massacres, persecution, revelation, testimonies, The Happiest People on Earth, visions. Bookmark the permalink. I am the grandson of Aram Mushegan. My grandfather told me stories of some of the things that happened in Kara Kala. He was also Demos Shakarian’s pastor for many years. I am very proud to be an Armenian and most of all a Christian. Ron, The grace of the Lord be with you. Do you mean Aram Mushegan, son of Mgrdich Mushegan? Yes! He was my Grand Father and I am the son of Nap Mushegan son of Aram son of Mgrdich. Do you know anything about what happened to that second letter? I am married to Aram’s great granddaughter. Yesterday the oldest of Aram and Margaret Mushegan’s children Mack passed away at 99 years old. The Lord blessed this wonderful man in so many ways however the most incredible was his personal relationship with our Lord and Savior Jesus Christ. What a legacy he has left his entire family. It is one that no amount of money or public accolade could ever bring. God bless this man and his many generations that will follow in his footsteps. Yes, my dad did leave a wonderful legacy, all of his children have a personal relationship with the lord Jesus. My dad Mack Mushegan is now enjoying his reward in heaven. We miss him, but know one day we will have a happy reunion. do you know if letter that was sealed was ever opened and revealed yet? hello! I wanted to know if that prophecy that was sealed was revealed yet? anyone knows?